Thousands of people lined the streets of Kilkenny City this afternoon for the annual St Patrick's Day Parade. ‘Bring Back the Bees’ was this year's theme - to highlight the importance of Kilkenny's recently-adopted county insect - and participants embraced it with enthusiasm. There were bees and beekeepers of every description imaginable - dancing on floats, cycling bikes, baby bees waving from cars. There was even a villain running up and down spraying 'insecticide' trying to stop the bees. 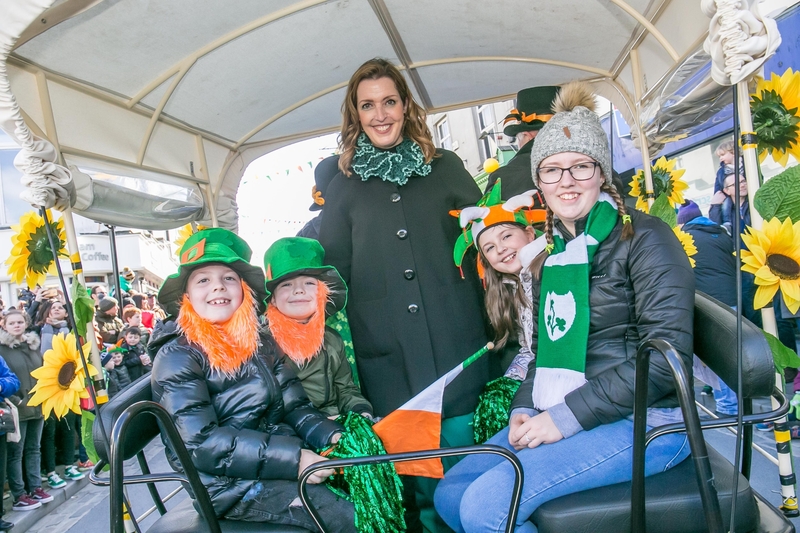 South Kilkenny native and recently-honoured Kilkenny Person of the Year Vicky Phelan was the parade's Grand Marshal, and she was accompanied by family members. A spill of rain threatened to scatter the crowd at one point, but it quickly passed, and the sun shone through. There was a great showing from local GAA and youth clubs, while a number of groups, including Kilkenny Storm and the gymnastics club, demonstrated their skills with a variety of on-street performances. Bands and music groups were not found wanting either. As in other recent parades, it was a day where Kilkenny's many diverse communities came out in force to showcase some of their own cultures, as well as celebrate their Irishness. The Sudanese, Filipino, and Polish communities were just some of those who took part in large numbers. This year, the parade began in the Market Yard, proceeding along High Street, up the Parade and onto Castle Road. Thankfully, there was to be no repeat of the infamous ham sandwich-throwing incident of 2012, for which no one was ever caught. There is still plenty of St Patrick's Day and Bank Holiday weekend fun happening around Kilkenny later on and tomorrow. A vintage funfair is in situ on the Parade, while a food market will also take place there until Monday. Check out your Kilkenny People Gig Guide for more.